Protect your Galaxy S7 in style with the gold LED View Cover from Samsung. This case offers 360° of protection and provides an innovative way of accessing your device status and notifications. LED lights appear on the front of your cover to notify you of calls and messages, battery life status, volume monitor, current time, and more. On the inside of the case is a single wallet pocket to store up to three cards or cash. 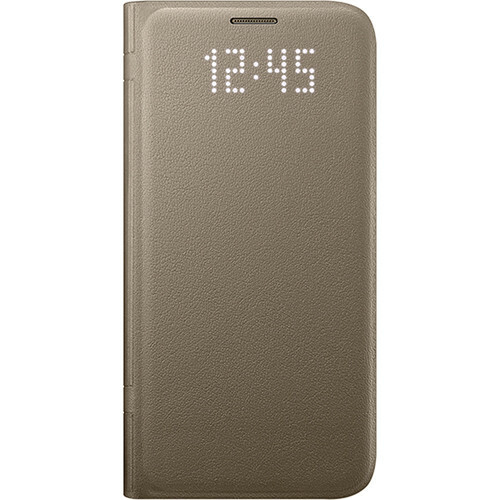 Box Dimensions (LxWxH) 7.0 x 3.6 x 1.0"
LED View Cover for Galaxy S7 (Gold) is rated 3.5 out of 5 by 13. Rated 2 out of 5 by 2425 from Was great till stopped working! Ive had this product not even two months and it already does not work. The leds have stopped coming on...complete waste of money. Im so disapointed bc i usually love samsung products! Rated 4 out of 5 by GasKetse from About the case The case is really great. Quality wise it has a nice touch and the leather is good as well. The only problem with it is the software. There are no third party notifications to it. You only get notifications for calls and text messages. If you have any other notification the case does not display anything. The problem is that it also covers the phone LED so samsung needs to fix it really quick! Rated 5 out of 5 by Kdub01 from LOVE it This LED case is the best the front lights up for calls messages alarm so on even allows you to swipe right from the front. Rated 3 out of 5 by Joy60 from product has some flaws When ordering this item I was excited about what I read concerning the features of this flip cover but upon using the product it performed poorly. I couldn't answer the phone by swipping it's cover. It worked 2 out of 5 tries. I had to send it back for repair. I just mailed it off so I'm waiting to hear from Samsung about the status of the flip cover. Rated 2 out of 5 by AwesomeS7Edge from LED case not worth the money I just received my new LED case today. The LED functionality is pathetic. It does not work as advertised. When the phone rings and you swipe left it does not turn off. Nothing happens. When you swipe right nothing happens. It does protect the screen. This case does work with the fast charger. Perhaps I should have ordered the clear cover instead. Rated 4 out of 5 by Anonymous from Galaxy S7 LED View Cover Design is nice and functional, quality is good, offers good protection to the phone, fitting is great, material is resistant but soft to the touch. Display is very convenient indicating the time, the charging mode and incoming call. I wish it would tell you also who is calling and it could let you answer the call without opening the flip cover. Overall is an excellent cover for my gs7.